"I'll Be Your Mirror, but I'll Dissolve"
When you come from the summer sunshine into the gallery's blacked-out space for Susanne M. Winterling's solo show, you find yourself in almost total darkness. 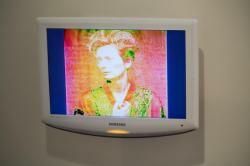 Then, as your eyes adjust to the low light, two films materialize on the walls, projected at about the size of paintings. 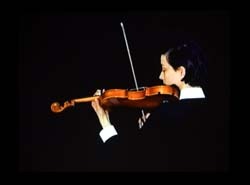 In one, a woman with short hair and wearing a crisp white shirt plays a violin. She holds the instrument with practiced confidence but leans close to it, as if improvising a dissonant tune. She gives the impression of physically extracting the music from the instrument through close probing. 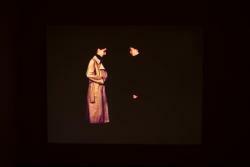 In the second film two women in dark suits stand facing each other, passing a beige raincoat back and forth. One places it over the shoulders of the other, who tries it on, buttons, then unbuttons it, takes it off and places its around the shoulder of her partner. The exchange is formal and tender, like a polite gesture that serves as a pretext for intimacy, an embrace that doesn't want to acknowledge itself as an embrace. A series of photographs extend the sense of reticent eroticism and vulnerability, of lives perceived in half-light. One of the photographs refers to the lesbian photographer and political writer Annemarie Schwarzenbach (1908-1941), who broke with her conservative Swiss family and lived a peripatetic exile's life, part of it spent in the United States where she documented racial violence.